While families welcomed the recent awarding of a unit citation and Bonn Jadotville medal, it is hoped eight of the men will be specifically awarded for their bravery. A CALL HAS been made for eight Jadotville survivors and their commandant to receive bravery medals for what they faced during the 1961 siege. That year, in an event which made international headlines, the 158 men of 35th Battalion A Company found themselves in Congo-Léopoldville, fighting against 5,000 of Kantanganese troops to survive. As they lay stuck in trenches, fighting off the approaching men, their supplies of ammunition, food and water dwindled over the course of five days. Several of the soldiers were in their teens, and the event had a huge impact on the men, some of whom said later they suffered from PTSD and depression. 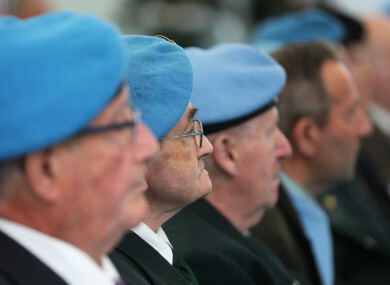 The entire group of soldiers who took part in the siege were awarded a unit citation last year and an accompanying medal, An Bonn Jadotville, this year. The move was roundly welcomed by family members of the men, but now it is hoped that the Department of Defence will go a step further and honour the wishes of the troop’s Commandant, Pat Quinlan – depicted in the film The Siege of Jadotville by Jamie Dornan – by giving some of the men medals for bravery. Remarkably, the men had suffered no loss of life during the siege, but after surrender were held as prisoners of war and hostages for about a month. The Irish State did not decorate any of the men for their actions, and there were repeated calls for the men to be recognised. Commdt Quinlan passed away in 1997, making him one of a number of Jadotville survivors who did not see their actions awarded in their lifetime. However, in 1965, Commdt Quinlan called for eight of the men to be given Distinguished Service Medals. He made the recommendation to the Defence Forces’s medal board, but it was not approved at that time. Since then, it has been called on for Commdt Quinlan himself to receive a Military Medal of Gallantry, due to his actions during the siege. Commdt Quinlan’s son, Leo Quinlan, told TheJournal.ie that from his perspective, awarding the medals “would be the final closure for the whole Jadotville episode”. It would be a win-win for the country, the government and the army; for the eight men and Commdt Pat Quinlan to be honoured in such a fashion. He described An Bonn Jadotville as a welcome and “very important step” for all the families and families of deceased veterans. It’s understood that family members of some of the survivors have contacted the Department of Defence and Minister Kehoe calling for the bravery medals to be awarded. Just one of the eight men is still living. In May, Minister of State Paul Kehoe was asked about the issue of awarding military medals to A Company, by Éamon Ó Cúiv. He said in response that the award of medals for bravery is time-bound, and they may not be awarded unless a recommendation is made through the usual channels to the Chief of Staff, not later than two years in the case of the Military Medal for Gallantry, and not later than four years in the case of the Distinguished Service Medal after the act in respect of which the recommendation is made. These awards are made on the recommendation of a Military Board. He said that subsequently, the question was raised again in a letter to a newly appointed Chief of Staff. He forwarded the letter to the original Medals Board and asked that they reconvene and review their decision. “The Board indicated that the issues raised had received due consideration and that they were not prepared to alter their findings,” said Kehoe. A review was conducted in 2004 by military officers as part of a broader examination of the Jadotville case. This board recommended that the events of Jadotville and the contribution of the 35th Battalion be given recognition. A plaque was unveiled in November 2005 in Custume Barracks Athlone to commemorate the events at Jadotville and the very significant contribution of A Company and of the 35th Battalion, as a whole, to the UN Peace Support Mission in the Congo. There are no plans to issue military medals to members of “A” Coy 35th Infantry Battalion. However, a further review of archival records is currently being undertaken by the military authorities. This will assist in informing any decisions regarding further recognition. In November of this year, Kehoe said that in June 2016, he and Taoiseach Enda Kenny decided to ward a medal to the men of A Company, and that it was an “exceptional measure that recognises their bravery and courage during the unique circumstances of the siege”. In an answer to a query on the issue, the Department of Defence noted the presentation of An Bonn Jadotville to the veterans of ‘A’ company 35th Infantry Battalion, and to the next of kin of deceased members. The Jadotville medal was presented on foot of a decision made by Minister Kehoe and former Taoiseach, Enda Kenny TD, to pay tribute to the professional and courageous actions of all of the men of ‘A’ company. Prior to this decision an archival review of military records had been conducted which failed to provide certainty in terms of any award, making this decision an exceptional step. However, it is understood that family members of Jadotville survivors will continue to call for the bravery medals, in order to mark what the men went through and the incredible bravery they showed in the face of such an extraordinary event. Email “Bravery medals would bring 'final closure' for Jadotville survivors”. Feedback on “Bravery medals would bring 'final closure' for Jadotville survivors”.